Grenada boasts the first underwater sculpture park in the Caribbean and has some of the most breathtaking dive sites. As one of the world’s sole producers of Nutmeg, guests can enjoy meals, massages, and delicacies made of the byproducts of this well-known spice and many other spices. Winner for numerous years of the Chelsea Flower Show in the United Kingdom, the island boasts some of the most exotic flora and fauna. Rum Factory tours are popular to experience the authentic distilling of our unique rums. Personalized butler service available in 69 Suites which will include Swim Up Pool Suites, Rondovals, and Skypool Suites. 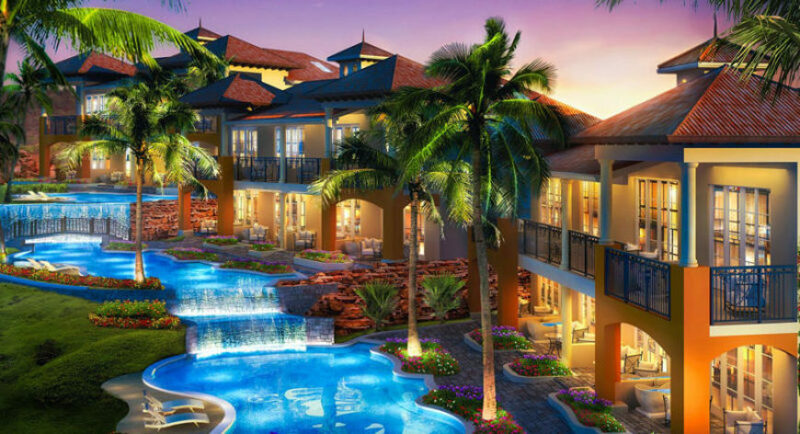 Sandals La Source Grenada Resort & Spa epitomizes luxury with 3 villages: The Pink Gin Village, The South Seas Village, and The Italian Village. 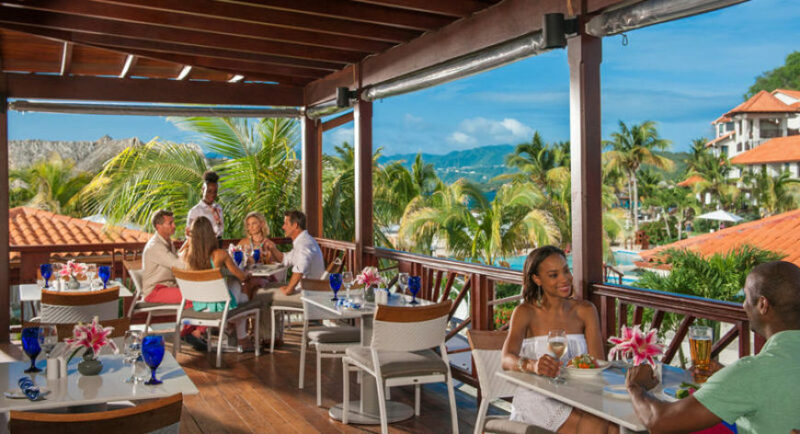 Gourmet Discovery Dining Options from a choice of 12 dining options including a world-class steakhouse – Butch’s Chophouse and Room Service for Butler serviced and Club Sandals accommodation. Air conditioning, amenity kit, hair dryer, telephone, ceiling fan, private bath and shower, iPod docking station, cable TV, coffee & tea maker, safe deposit box, iron, and ironing board. All guest rooms boast mahogany furnishing and tiled floors. Perched atop the Italian Village, these magnificent oversized suites feature a full living room with butler pantry, wet bar, indoor dining table, plush sofa and chairs, and Smart TV. There is also a desk with wireless internet and USB ports. The double doors open to a luxurious bedroom which boasts a king size bed, large smart TV and convenience outlets for 110 and 240 volts. The bathroom includes two Carrera marble vanities with backlit mirrors, Kohler claw footed tub, separate frosted glass shower and a frosted glass water closet. The bedroom opens for access to a cantilevered heated private plunge pool with an infinity edge. The flooring is made of Turkish ivory patika travertine natural stone with accents of pebbles and porcelain planks from Italy. This suite also has an oversized balcony with two comfortable lounge chairs, ottoman, side table and tranquility soaking tub. Butler service included. On the third, fourth & fifth floors of the Italian village, these magnificent oversized suites feature a full living room with butler pantry, wet bar, indoor dining table, plush sofa and chairs, and Smart TV. There is also a desk with wireless internet and USB ports. The double doors open to a luxurious bedroom which boasts a king size bed, large smart TV and convenience outlets for 110 and 240 volts. The bathroom includes two Carrera marble vanities with backlit mirrors, Kohler claw footed tub, separate frosted glass shower and a frosted glass water closet. The bedroom opens for access to a cantilevered heated private plunge pool with an infinity edge. The flooring is made of Turkish ivory patika travertine natural stone with accents of pebbles and porcelain planks from Italy. Some suites also have an oversized balcony with two comfortable lounge chairs, ottoman, side table and tranquillity soaking tub. Some have an oversized day bed. Butler service included. This large junior suite includes a step-down parlor area with an oversized sofa, wet bar and Smart TV. There is a large bedroom with a king size bed which features a writing desk with USB outlets along with convenience outlets for 110 and 240 volts. The bathroom features a walk-in shower, soaking tub, vanity and dressing unit. Walk-in closets are adjacent to the bathroom. The parlor area opens to an entrance to the river pool with two pool chaise lounges. Butler service included. This large junior suite includes a step-down parlor area with an oversized sofa, wet bar and Smart TV. There is a large bedroom with a king size bed which features a writing desk with USB outlets along with convenience outlets for 110 and 240 volts. The bathroom features a walk-in shower, soaking tub, vanity and dressing unit. Walk-in closets are adjacent to the bathroom. The parlor area opens to a large balcony with tranquillity soaking tub, two comfortable lounge chairs and a dining table. Butler service included. 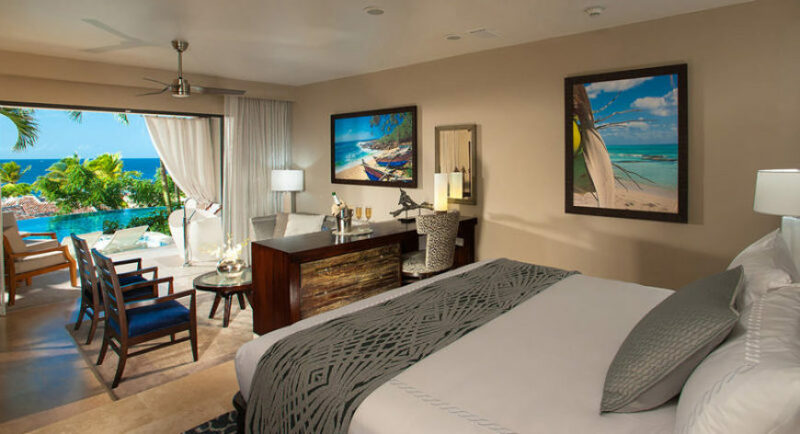 Tahitian style suites include a separate living area with sofa, Smart TV and wet bar. The bedroom features a king size bed, and convenience outlets in 110 and 240 volts. The bathroom includes a freestanding soaking tub, frosted glass enclosed water closet and his & hers vanities with backlit mirrors. The walk in shower has a rain shower with dual controls. The flooring is a mixture of ivory patika and porcelain planks with pebble and coral stone accents. 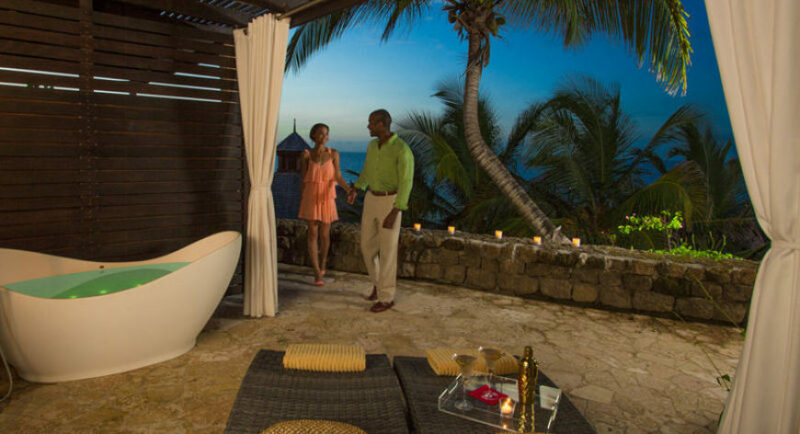 The outdoor sundeck is accessible by either the living room and features an outdoor grotto shower and a waterfall that spills into a plunge pool with private whirlpool. Butler service included. The living area includes a Smart TV, indoor dining and full wet bar. The bedroom features a king size bed and convenience outlets for 110 and 240 volts. The flooring is a mixture of ivory patika and porcelain planks with pebble and coral stone accents. The bathroom boasts a large soaking tub carved out of solid stone, his and hers vanities with backlit mirrors, frosted glass shower and water closet. The large patio has a hot tub with waterfall, zero entry plunge pool, and wet lounging area. You can access the pool from the bedroom. Butler service included. Entering the suite through the porte cochere, you will find a full living room with a wet bar. The living room opens up to a trellised veranda, double chaise lounges, and exterior dining. The luxurious bedroom boasts a king size bed, Smart TV and convenience outlets in 110 and 240 volts. The bathroom includes two Carrera marble vanities with backlit mirrors, freestanding soaking tub carved out of solid stone, frosted glass shower and water closet. The flooring is Turkish ivory patika travertine natural stone with accents of pebble and porcelain planks from Italy. The bedroom opens up to an infinity edge private plunge pool and outdoor shower. Butler service included. You enter this large room through your patio. The bedroom includes a king size bed, Smart TV and convenience outlets in 110 and 240 volts. The bathroom features a tub, walk-in shower, freestanding vanity with backlit mirror, water closet enclosed in frosted glass and a walk in closet. The patio features a tranquillity soaking tub and a chaise lounge. The room walks out to the unique waterfall river pool. Enter this large bedroom from a covered vestibule. The bedroom features a king size bed, Smart TV and convenience outlets in 110 and 240 volts. The bathroom boasts a large walk-in shower, vanity, and water closet enclosed with frosted glass. Walk out onto your balcony, which features outdoor dining, a tranquillity soaking tub and a chaise lounge. This junior suite overlooks the waterfall river pool. You enter this large room through your patio. The bedroom includes a king size bed, Smart TV and convenience outlets in 110 and 240 volts. The bathroom features a walk in shower, freestanding vanity with backlit mirror, water closet enclosed in frosted glass and a walk in closet. The patio features a free standing tranquillity soaking tub and a chaise lounge. The room walks out to a radial pool. Enter this large bedroom from a covered vestibule. The bedroom features a king size bed, Smart TV, and convenience outlets in 110 and 240 volts. The bathroom boasts a large walk in shower, vanity and water closet enclosed with frosted glass. 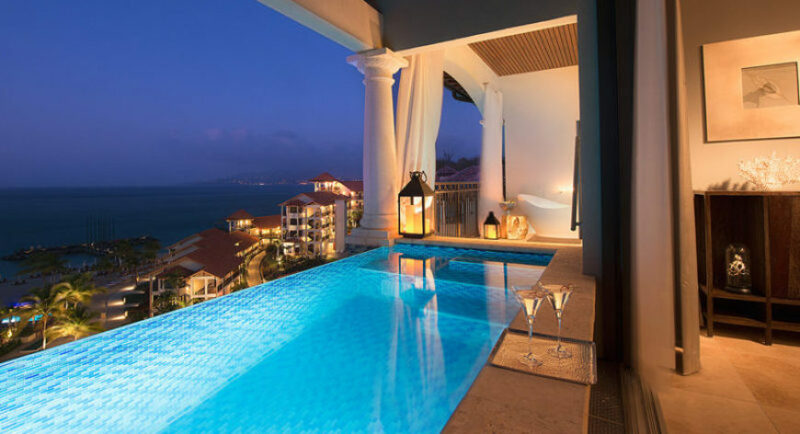 Walk out onto your balcony, which has a tranquillity soaking tub and a chaise lounge. A nicely appointed bedroom featuring a king size bed, Smart TV and convenience outlets for 110 and 240 volts. The bathroom includes a walk in shower, vanity and separate water closet enclosed in frosted glass. All rooms have a patio or balcony, a tranquility soaking tub and also feature outdoor dining and chaise lounge. A large suite consisting of a living area with a sofa, chairs, cocktail table and bar. The bedroom boasts a king size bed, ivory patika marble floors and Smart TV. The bathroom has a water closet enclosed in frosted glass, extra-large basin with backlit mirror, Carrera marble vanity, walk in overhead shower with wall mounted dual controls, white subway tile and glass accents. The bathroom is further enhanced with pebble accented walls and Italian porcelain plank floor. There is also a window looking into the bedroom. One unit has a shower / bath tub combination. Club Sandals service included. All rooms feature either a patio or a balcony. Located directly on the beach, you can walk out of the room and onto the beach. The bedroom features a custom mahogany king-size bed, Smart TV and ivory patika marble floors and dining table. The bathroom boasts a walk in shower with subway tile and glass accents, an overhead showerhead and wall-mounted dual control. There is a window looking into the bedroom. The walls are pebble accented and the floor is Italian porcelain plank with an extra-large basin, backlit mirror, and Carrera marble vanity. Club Sandals service included. All rooms have a patio with two lounge chairs and a tranquility soaking tub. Located in the Pink Gin Block, these rooms boast a king size mahogany bed, vaulted ceilings, marble floors and Smart TV’s with an in-room dining table. The bathroom features porcelain plank floors, walk in overhead shower with wall mounted dual controls, white subway tiles with glass accents. There is also a window opening up into the bedroom. The water closet is enclosed in frosted glass and there is an extra-large basin with backlit mirror and Carrera marble vanity. Club Sandals service included. A large suite consisting of a living area with a sofa, chairs, cocktail table and bar. The bedroom features a king size, custom mahogany bed, Turkish ivory patika marble floors and Smart TV. The bathroom includes a private water closet enclosed in frosted glass, extra-large basin with lit mirror, Carrera marble vanity with either a walk-in shower or tub with white subway tile and glass accents. The walls are pebble accented along with Italian porcelain plank floors. Two units have a shower / bath rub combination. Club Sandals service included. The bedroom boasts a custom mahogany king size bed, Turkish ivory patika marble floors, Smart TV and in room dining table. The bathroom includes a private water closet enclosed in frosted glass, extra-large basin with backlit mirror, and a Carrera marble vanity. There is a walk-in overhead shower, wall mounted dual controls with white subway tiles with glass accents. There is a window looking into the bedroom. The walls of the bathroom are pebble accented and the floors are porcelain plank. Some rooms feature a vaulted ceiling. Room includes a mahogany king size bed, Turkish ivory patika marble floors, Smart TV and table for in-room dining. The bathroom features a water closet enclosed in frosted glass, extra-large basin with backlit mirror, Carrera marble vanity and walk-in shower with white subway tile with glass accents. There is a window looking into the bedroom and the walls are pebble accented with porcelain plank floors. All rooms have a balcony. Room includes a mahogany king size bed, Turkish ivory patika marble floors, Smart TV and table for in-room dining. The bathroom features a water closet enclosed in frosted glass, extra-large basin with backlit mirror, Carrera marble vanity and walk-in shower with white subway tile with glass accents. There is a window looking into the bedroom and the walls are pebble accented with Italian porcelain plank floors. All rooms have a patio with two lounge chairs and a tranquillity soaking tub. Room includes a custom mahogany king size bed, Turkish ivory patika marble floors, Smart TV and table for in-room dining. The bathroom features a water closet enclosed in frosted glass, extra-large basin with backlit mirror, Carrera marble vanity and walk-in overhead shower with dual controls. The bathroom also features white subway tiles with glass accents. There is a window looking into the bedroom and the walls are pebble accented with Italian porcelain plank floors. Two units have shower / bath tub combination. Dress pants/trousers or jeans for men, long or short sleeve dress shirts (with or without collar). Dress shoes or elegant sandals. No shorts, t-shirts, sleeveless shirts or sneakers. 24-Hour Room Service exclusively for all Butler Serviced Suites. 7:00 am to 10:00 p.m. for all Club Sandals accommodations. Staff Talent show, Live Band & Piano Sing-A Long. Delve into Grenada’s rich cultural heritage. A vibrant show featuring Ginger & Friends. An exclusive white themed event to simply enjoy each other with romantic live music. Infuses the best of all the Caribbean has to offer. *There are a select few dives which will attract an additional charge. Exercise in a group! Rather than jump on a machine, get your workout by moving to the beat of your favorite songs. CERTIFIED and dedicated Fitness Professionals will lead you through a workout of a variety of movement combinations that exercise your muscles while you have fun in the sun at the same time. Our up-to-date classes are not intimidating and persons of ALL ages and fitness levels will enjoy our classes. Our Fitness facilities are fully air-conditioned and have state of the art Life Fitness equipment is available 24/7.